I was trying to wrap my head around making these Baked Alaskas for a while, trying to figure out how to scale down the recipe and not have too much waste. Since I didn't follow a precise recipe, there had to be some cake leftovers and a little extra meringue. I decided not to sweat it and just go ahead and make these little dessert wonders. To start with, the key thing for me was making the cake base. Martha's recipe turned out great. Folding beaten egg whites into the batter makes for a very light, spongy cake. And using oil (instead of butter) in the cake allows the cake to remain relatively soft even after freezing so the cakes are easy to cut into and eat. As you can see, I used different size bowls to make my Baked Alaskas. You can essentially use whatever bowl/cup you have. After packing in the ice cream and setting the cake base on top, I wrap the cakes up with the plastic overhang, placed them on a small baking sheet, and stowed them away in the freezer. This should be done at least the day before. And if you find yourself with a good amount of extra cake left, you could always cut it up (wrap it and freeze it for another date) and use it to make a trifle. When it's time to make the dessert, unmold the ice cream cakes. I found it very helpful to set the bowls in warm water for a few seconds. Then, they pop right out. Set the unwrapped cakes on a baking sheet and return them to the freezer to firm up while making the meringue. You want the ice cream cakes as solid and cold as possible. The swiss meringue worked beautifully and held up very well! I had thick, glossy, sticky, marshmallow-like meringue to apply on to the ice cream cakes. I put on a thick layer and used a spoon and offset spatula to make swirls and swoops. Torching them was a lot of fun. It happens so fast and the meringue just smells so toasty and delicious. I finished these on the afternoon of the first day of school. I, very carefully, let my son help me torch one of these. And there we have it...a few mini Baked Alaskas! The sweet, toasty meringue with ice cream and chocolate cake is quite an irresistible combination! I'm amazed by this dessert and the wizard who first dreamed it up. Preheat oven to 350 degrees. Spray a 9x13 inch cake pan with cooking spray and line it with parchment paper. Sift 2/3 cup of the sugar, as well as the flour, cocoa powder, baking powder, baking soda, and salt into a bowl. In a measuring cup, combine the oil, water, and vanilla. Place egg yolks in the bowl of a stand mixer fitted with the whisk attachment. Whip on medium-high speed until pale and thick, about 4-5 minutes. With machine running, slowly add the oil mixture, then add the dry ingredients, mixing until combined. In a clean mixing bowl (and clean whisk attachment), whisk egg whites on medium-high speed, gradually adding the remaining 1/3 cup of sugar, until medium-peaks form. Mix one third of the whites into the cake batter, then gently fold in the rest. Scrape batter into the prepared cake pan, smoothing out the top with an offset spatula. Bake until cake is set and springs back lightly to the touch, about 15 minutes. Let cool on a cooling rack before inverting onto a cutting board and removing the parchment paper. To assemble the Baked Alaskas, cut out 3 cake rounds using the bottom of the bowl you are using as the mold (you need it to fit the bowl you're using snugly to become the base of the ice cream cakes). Coat the 3 glass prep bowls with cooking spray. Line each with plastic wrap, leaving plenty of overhang. Fill each bowl with ice cream, leaving enough space to fit the cake rounds. Top each with a cut out cake round and press down lightly. Cover the assembled cakes with the plastic overhang. Freeze at least 4 hours or overnight (you can do this days ahead). Unmold the cakes by opening up plastic wrap, flipping the cakes out onto a baking sheet and removing the plastic wrap (if necessary, place the bowls in warm water for a few seconds and the cakes should release easily). Place cakes back in the freezer while making the meringue to allow it to firm up and be as cold and solid as possible. To make the swiss meringue, heat egg whites, sugar, and cream of tartar in a heatproof bowl over a pot of simmering water. Whisk often until sugar dissolves and the mixture is warm to the touch and turns white in color, about 2-3 minutes. Transfer bowl to the mixer and whisk until stiff, glossy peaks form. Glad you like that...taking pictures of ice cream related things is hard...for me, anyhow. I was lucky to have my hubby help with this! They look perfectly perfect, Monica. I wish I could have a small slice. I tried to limit myself to a few bites. : ) I could eat a whole mini if I let myself...we all know that feeling. Oh my gosh Monica! You are my hero - I've always wanted to make this and your desserts are gorgeous! 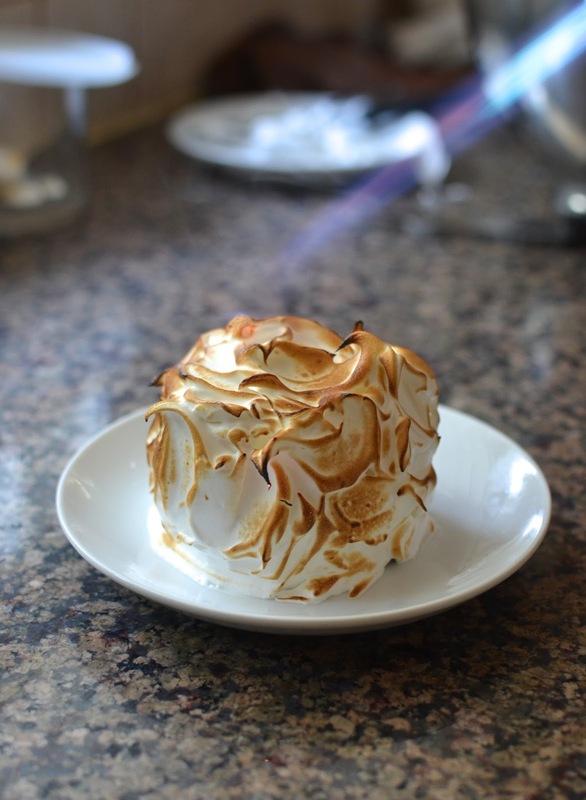 You are a master with the torch and the meringue looks fantastic. Congratulations on a beautiful, delicious, successful dessert. Great photos too - have a lovely weekend! Thanks for the kind words...there is something crazy special about the baked Alaska, I agree. Thank you so much, Monica. It's so funny you say that about finding it on menus...I have never had it, come to think of it! It's just one of those desserts I've seen and just love and always wanted to make and see if I could. The kitchen blow torch is totally a great investment if only for this project. haha. And "remarkably delicious" is a great way to put it...something about the combination just makes you swoon. Best ice cream cake ever! tHi Monica, I have to tell you I think this is the most beautiful cake I have ever seen, spectacular really! Thanks, Bonnie. The torch does all the work in making it "fancy", doesn't it! Your baked alaskas are stunning! I haven't made them, but they are definitely on my wish list. It was on my wish list so long...now I've finally done it. Hope you enjoy one soon, Beth! 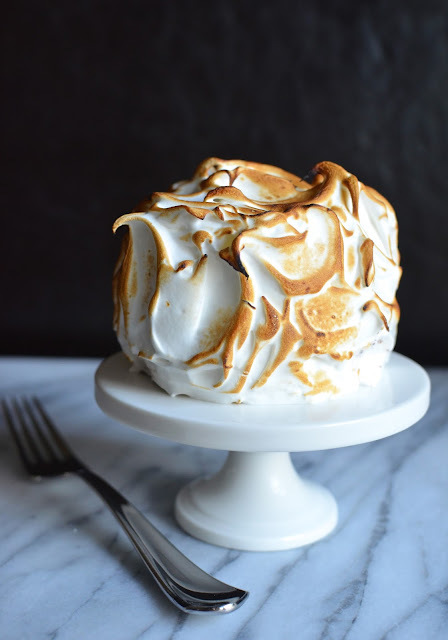 Oh my goodness, I have always wanted to make a baked Alaska and yours look gorgeous!!! I love that you scaled them down and used small bowls to make mini ones, so adorable and perfect if you don't want a ton of leftovers. Your step-by-steps are so helpful and I can just imagine all the fun you had making them :) They're absolutely perfect! 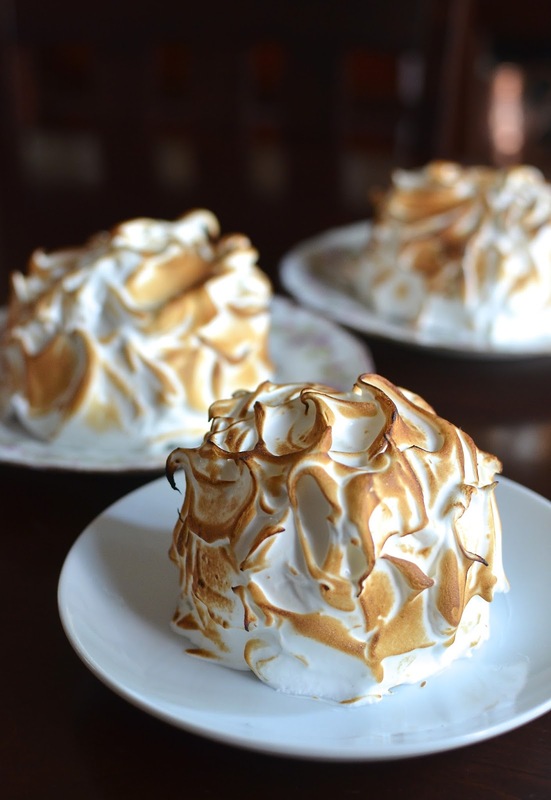 You would make a gorgeous baked Alaska! I would love to see that but so many things to make/eat, so little time, right! Thanks for your sweet words, as always. Have a wonderful week! Hi Juliana - thank you! It was a real treat. Enjoy your week as well! WOW! This is so impressive! I loved this cake! Looks fantastic! Thanks for sharing! 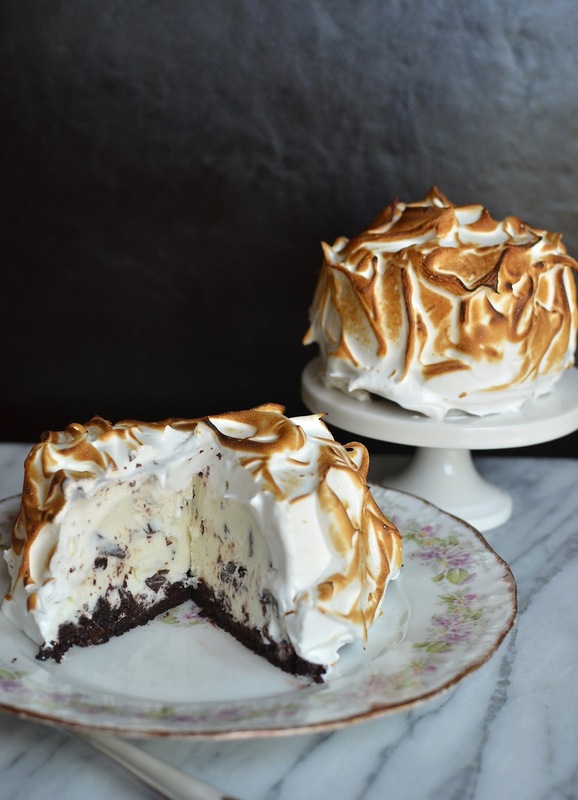 love the look of Baked Alaska! i think we've only tried it once and loved it! Absolutely gorgeous! I will need to go back to school, so I can enjoy a cake like this! :P It looks a lot easier than I thought. I'm bookmarking it for later. haha - you don't need any occasion to treat yourself! : ) You can totally use store-bought cake/ice cream and just make the meringue if you wanted to go that route...but somehow, I have a feeling if you made it, it'd be thoroughly homemade and spectacular. Thank you, thank you, Jo! I always think they are kind of magical even though I don't think I'd ever had one before making these! Crazy, isn't it. I knew you'd like the celebratory cake concept...there's *always* a reason to celebrate and make/eat cake! !